The dreaded South Indian summer is expected to take a break as temperatures are expected to come down over the week. Interior thunderstorms will still continue to show presence during evenings owing to inland convergence and other favourable atmospheric factors. Meanwhile, the disturbance over the bay is expected to develop into a low pressure area by numerical models with an unclear consensus on the track and intensity. As an additional piece of info, IMD had announced that South West monsoon will set over Kerala on May 30. 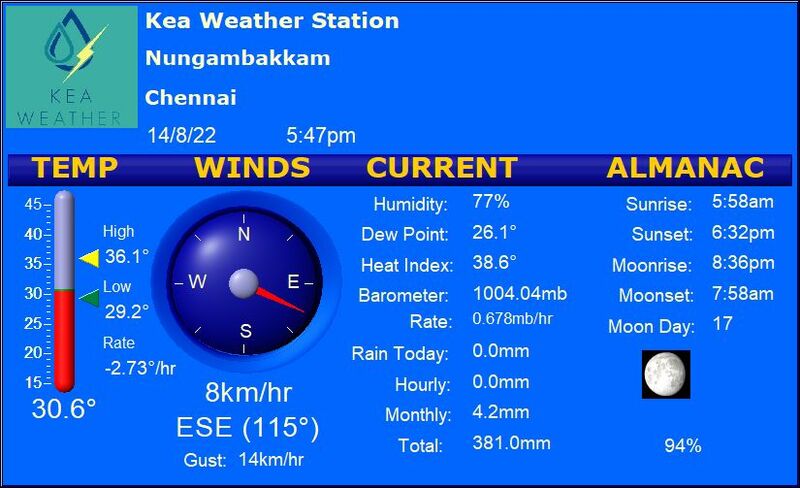 Chennai – Mostly clear and moderately warm with a high of 37 degrees and a minimum of 28 degrees. Madurai – Partly cloudy sky with a maximum of 37 degrees and a minimum of 27 degrees. Tiruchi – Warm and breezy. High of 39 degrees and a low of 28 degrees. Vellore – Hot with a high of 41 degrees and a minimum of 26 degrees.